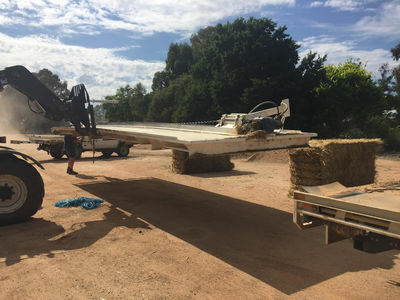 in Australia : do you have suitable trailer for installation ? a petrol pull start 5 HP or 6.5 HP key start power pack with wireless remote control can be mounted on goose neck or tow assembly. So anytime you can't use your pick up it can be switched over to tractor at a moments notice. Once you hook up your pick up its an amazing fully independant solution. Notice no manual pulling of strings.Strings cut & tied so that they collect on rope while feeding out & if you study video strings are collecting & trailing behind. IN AUSTRALIA: we dont have the option of very reasonably priced trailers like in USA so we install kits on new or used trailers sourced by you. We travel to all States to install kits. The same power pack unit as mentioned above is ideal for those wanting to feed out from utes, trucks towing semi trailers or any of the range. "we completed installation of our 6 bale feeder (detachable shown below & in video below feeding sheep) in June 2016. Previously our hand feeding comprised 6 men on 3 days per week. With this amazing machine one person now completes the job on his own. "....Noel Pengilly Glenleigh Pastoral Eugowra NSW. "WE DON'T LET OUT A COLLECTIVE GROAN NOW WHEN HAY FEEDING IS MENTIONED in fact Gordon does it on his own & enjoys it" Andy Willalooka Pastoral South Australia. 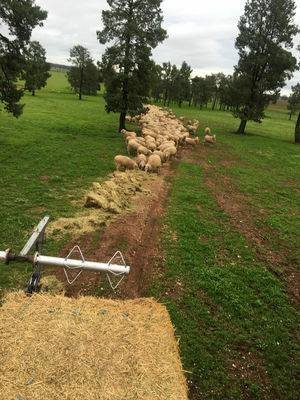 I have found The Sinch to be an incredible solution for feeding out 150-200 bales per week easily by myself "...Neil Williams Western Victorian farm worker. Sinch Square Bale Feeders available in models to feed out 6,8 & 10 hay bales per trip. The 6 square bale feeder has been working a treat & it has cut down this part of our 8000 acre operation by at least 70 per cent and only requiring one labour unit. "Incredibly simple and user friendly hay trailers with automatic string collection. All the string is collected as the bales are fed out!" 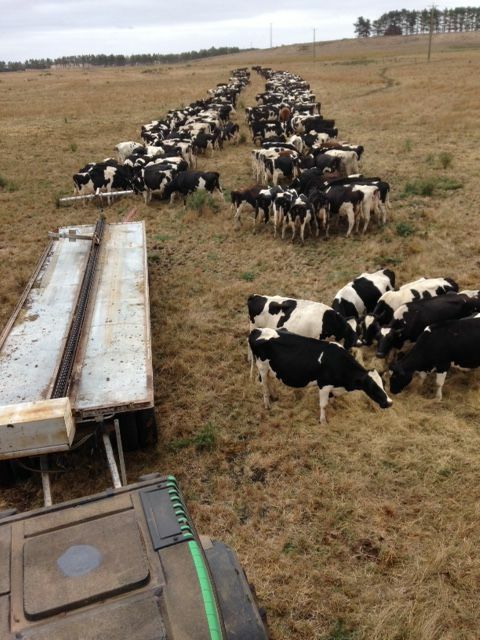 "It is very quick, simple and cost effective"
"The 8 square bale feeder model can feed the lot in under 10 minutes!" 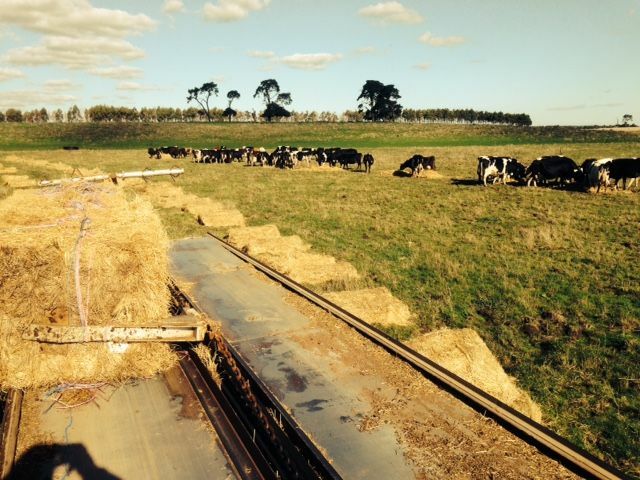 "We aquired (April 2013) a 6 square bale feeder machine , it is such a simple design and is very easy to use. 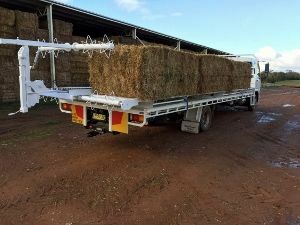 I am very happy with how it has made feeding square bales such an easy job!" Matt Warnes Dairy Farmer 700 cows. Pyree. N.S.W. Australia. 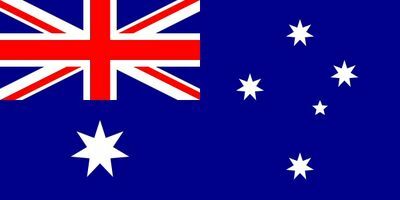 We have very satisfied customers here in Australia stretching from Greenwell Point NSW to Bringo near Geraldton WA. The square hay bales are pushed end to end (any number up to 5) through the rear flaker then one side completed the pushing arm is brought back to the front, then swung over to feed out the other side-this is the key to the stunning ease, speed & simplicity of this bale feeder! 8 bales can be fed easily in under 10 minutes! This square bale feeder is really simple, tough, durable, foolproof and a one person operation. It is extraordinarily impressive in operation with just one hydraulic motor operating the entire machine smoothly & effortlessly without the operator getting a sore neck! Contact Sinch Bale Feeders Now - your queries are most welcome and will be promptly answered! The most common/popular feeding rate is approximately 1bale every 45 seconds and it never jams in smooth continuous operation.But it can be quicker(1 bale per 18 seconds if needed 8 bales can be fed out in under 3 minutes!) or slower depending on customer requirements. Trailer use is generally undiminished! Extremely safe labour saver -operates from just one cab hydraulic lever- only 2 hoses, no electrics. Sinch Square Bale Flaker- breaks up bales into ideal sized flakes. Farmers comment on higher feeding efficiencies (less spoilage) with well spaced flakes. All Sinch Square Bale Feeders ™ are Hydraulic. has a 12 month guarantee. The sinch mechanism primary components are of extremely strong highly durable steel sourced from the mining industry with a working load capability much greater than what is required, resulting in the Sinch Bale Feeder lasting for many,many years with virtually nil maintenance. Very little loss of valuable leaf in clovers, lucerne/alfalfa etc because this machine does not shatter, process or tease fodder and the flakes land on the ground relatively intact.